There’s a border battle going on between Minnesota and Wisconsin, a battle between the policies advanced by Gov. Mark Dayton and Gov. Scott Walker. After taking these divergent paths, people naturally started comparing which path is leading to better economic outcomes and opportunities for the people of each state. Despite the fact that Dayton’s tax the rich, spendthrift policies have barely been in place for two years, liberals are already claiming victory. More recently, former Minneapolis Mayor R.T. Rybak penned a Star Tribune column claiming Walker “destroyed [Wisconsin]’s economy,” which was followed by President Obama’s trip to La Crosse, Wisconsin where the President himself declared, “Minnesota’s winning this border battle.” Liberals simply can’t get enough of comparing Dayton and Walker. Here’s just a few more outlets declaring Dayton the winner: The American Prospect, LaCrosse Tribune, Mother Jones, and Huffington Post. Liberal victory speeches touting Minnesota and Gov. Mark Dayton as the shining beacon of progressive policy success to the country simply do not square with two simple economic realities revealed in the graphs below. First, Minnesota’s economy pulled ahead of Wisconsin’s well before Dayton and Walker took office. 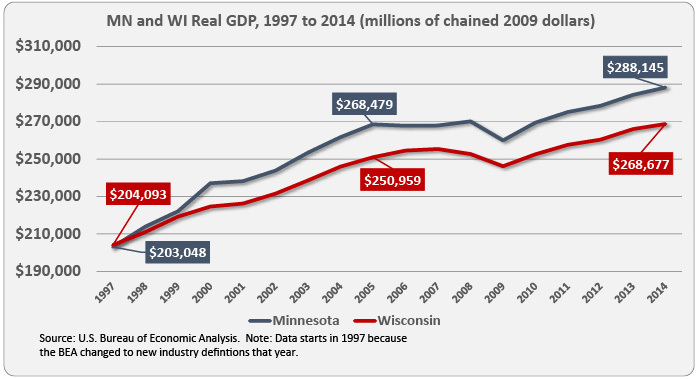 The following graph shows Minnesota’s economy was just a hair smaller than Wisconsin’s in 1997, but began growing larger in 2000. By 2005, Minnesota’s economy grew to be 6.53 percent larger, which in actual dollars works out to be a $17.5 billion difference. And since that time, not much has change in relative terms. In 2013, Minnesota’s economy was 6.43 percent larger and last year it was 6.76 percent larger. This is consistent with other measures of economic performance, such as per capita personal income or employment, which show Minnesota began improving relative to Wisconsin a long time ago. These data show whatever lifted the Minnesota economy above Wisconsin must be linked to something that not only predates Dayton and Walker, but even predates Governors Tim Pawlenty and Jim Doyle. And it’s worth noting Minnesota income tax rates went down in 1999 and 2000. Second, though Minnesota’s economy might beat Wisconsin’s, both states have lost ground to the rest of the country. 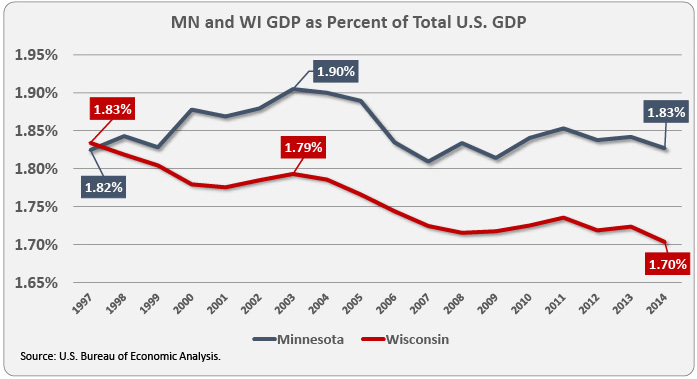 The graph below shows Minnesota and Wisconsin GDP as a percent of U.S. GDP. The slice of the U.S. economic pie declined for both states between 2003 and 2007 and has remained relatively steady since. This strongly suggests neither state has the ideal mix of policies in place to compete for a larger portion of the U.S. economy. Minnesota is therefore no example to the nation of a progressive policy triumph. Instead, the main takeaway here should be that Minnesota can do better. How? A deeper dive into the data reveals lower taxes can help. More on that next week.